Interesting information about Allan. Thanks, Vrinda! Shows again that you need a lot of courage and belief in the own ablilties and most of all stamina (don't know if this is the right word for what I mean; I mean the strength to face all the obstacles on the career ladder up). Good that things happened the way they did. 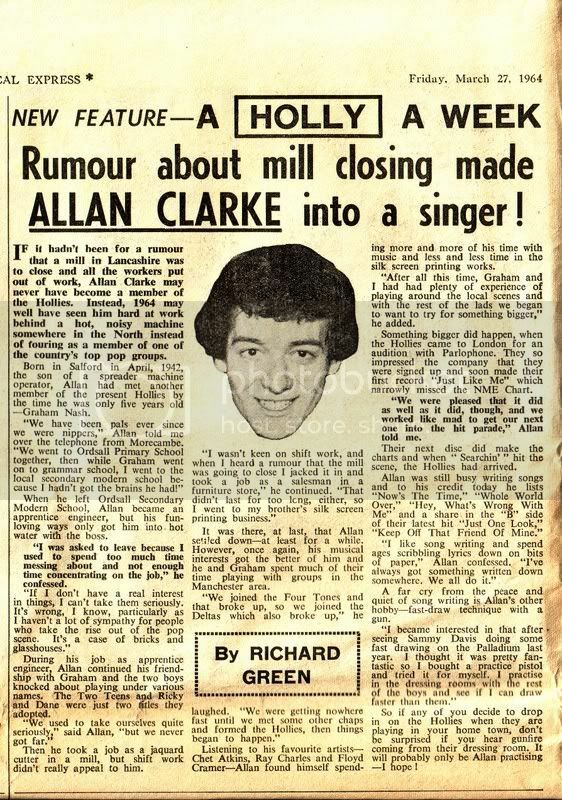 and the world got The Hollies. Thanks, Benny! Yes, stamina is the best word to describe it. I would also say determination and strenghth. Allan had it all - and we've been blessed because of it. Just think, it was all because of a rumor that we're here talking! What's going on here? This is an interesting article, and so far only Benny has commented on it? Is everybody just shy? Interesting that Allan claimed a role in writing "Keep Off That Friend of Mine"...the only credits I've ever seen for that tune say it was written by Tony and Bobby. I've read elsewhere about Allan's infatuation with fast-draw gunfighting from the old West. I think we can see the source for Curly Billy, can't we? Yes, but disturbing that he would be fooling around with a gun, even in jest. Sounds like David Crosby shenanigans, or Phil Spector, both of whom lost their minds decades ago. Well, a cap gun isn't quite the same thing as a real firearm. That does explain the fast-draw he used in the "Carrie Anne" promotional film. Still, though, I wouldn't want to be within shooting range of that dressing room when Allan is practising! I'm not at home, so I can't check, but isn't there a small pic in the booklet that came with 'The Long Road Home' that shows Allan in full gunfighter gear? I love the look of Allan in the Carrie Ann promo.I was always partial to the cowboy look (does anyone remember Alias Smith and Jones? ).Allan's just a big kid,bless him! But seriously,I think we can see here that Allan looked up to Graham from an early age as he saw Graham as being more intelligent as himself.This is probably why he let Graham lead the way so much eg. in the psychedelic period.Anyway,Vrinda,nice job yet again-you're a star! Aw, thanks, Paula! You're too kind! Yes, I always thought there was some admiration Allan had for Garham. He looked up to him, sort of like an older brother. Graham is two months older than Allan, and he was the one befriended Allan way back when Allan was the new kid in school. Because of this, I can understand his feeling hurt and betrayed when Graham left. Yes, Brandy, there is one. I'll post it here later (thanks to Snowflake for sending it to me! ).